I was answering some questions for an interview recently, and one of the questions was about how I got started making plush things. As I was thinking it over, I remembered back to when I didn't do any sewing. I didn't grow up sewing or being "crafty", I was actually the kind of person to tell you that I was the complete opposite. Then I thought about it more, and I realized that this could be an encouragement for someone. Right after I graduated high school, I had no real idea of what I wanted to do or be. I often complained to Johnny that I wasn't good at anything and I didn't have any talents. Though he tried to reassure me countless times, I still felt uncreative and lost. I just assumed that people who were good at things just "got" them and I hadn't really "gotten" anything. If only someone had said, "Sweetie, you have to explore. Don't be afraid to TRY." So, I'm here to say that to you. Don't be afraid to explore things. Don't be afraid to fail. Don't be afraid to TRY. It's alright if you don't know who you are or what you are interested in. It's okay to be scared of new things and even feel incredibly intimidated. It's fine not to have it all figured out. In a lot of ways I feel like I'm still sorting through that. One thing that I never admitted to myself was that being good at something is a bit of talent, but it is also a LOT of hard work. There are many failures along the way, but you learn so much from them and grow all the more. I'm not saying that I have everything totally figured out, but I do know that there was a point when I was afraid of trying because I was afraid of failing. When I finally decided to believe in myself, it opened me up to so much. Now I feel pretty satisfied doing something that I'm really proud of. I love this inspirational post :) It is so lovely that you persisted; you toys are truly amazing! I have the exact opposite problem which, if you can believe it is equally frustrating. I have too many interests and passions and creative outlets that I am good at (please don't take this as bragging!) and so I can't focus or plan where I want to go career wise. I know this much though, All I want to do is open a bakery and be a Mom. I've never felt like college was for me or necessary at all but here I am and such is life. I feel like I am wasting time being lost in everybody's expectations for now. 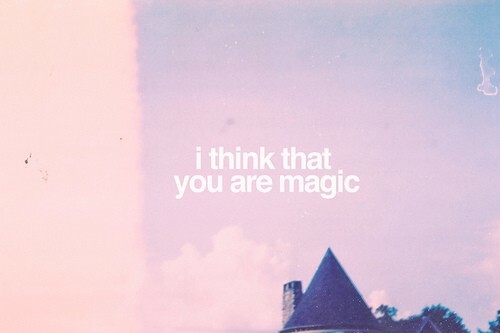 And I think that you are magic too. This made me smile this morning, as I've just graduated from uni, and have come to the drop off point and many of us discussed while in our 3rd year. My interests lie in anything textiles and crafty - would love to find a job in costume theater design soon, for the time being I'm sticking to my 9 to 5 job. However saying this I am volunteering with a theater company through this summer and it's going really well... and after this one I'm working with another. What a great post! I went through the exact same thing before I found sewing, I desperately wanted a creative outlet. A quote that I stumbled across recently sums it up pretty well,"anything worth doing is worth doing badly". That and the secret weapon we all possess is practice, it seems like so many people avoid hard work and think people magically get good at stuff, but if you don't enjoy that part of it then whats the point. I like going through people who I admire flickr sets and looking at their old work. Heidi Kenney of My Paper Crane for example, she has come so far when you look at her early work, now she cant construct anything! It's very inspiring(as is watching you progress in your skill:) Thank you for this post and your inspiration/motivation. It is also important to remember that it can take many "trying" times (double meaning intended) before things start to work out and fall into place. Thank you for the reminder and the inspiration! I'm so happy to read this! I had the exact same experience. I used to be so upset thinking I had nothing I was good at - I didn't have a hobby. I didn't know what I liked. 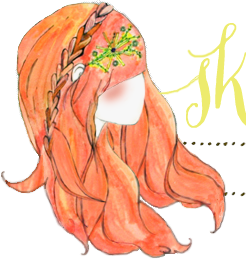 But now, thanks to crafting and blogging, I feel like I have lots of hobbies. You are such an inspiration Skunkboy! Thank you for that post! It is so great for those of us still searching, to see that those who have found were once looking too. thank you for this. nice to know that i'm not the only one who has to search! Great post to read first thing in the morning when I plan to get a lot of writing done. - such a lonely process. My biggest problem when it comes to most things is patience and discipline. I can get so distracted and of course, having a 17 month old doesn't help matters! :) Wouldn't trade her for anything though. I have felt exactly the same way (and said exactly the same things to my husband!) I've only recently been ready to try new things without the absolute assumption that I will fail at them. Life is short! We must be brave and bold and jump in wholeheartedly! and also thank you to your lovely commenting readers. I know they re writing to you but it's so full of nice feelings that I couldn't restrain myself. What a great post! Thanks so much for this! I have watery eyes, tear streaming down my face reading this. You pretty much described my creative block that I'm struggling with right now. Thank you for this. I think I will be rereading this post a lot when I need that boost of encouragement. Thank you for sharing Katie. You re right to get to be good at something requires a LOT of work and a process. Today I'm thankful for this blogpost and the encouragement you are so willing to share! I needed this encouragement too- thanks! such a perfect encouragement! great post. well said, thank you so much for this! This post WAS really inspiring to see that someone who has such an amazing talent and passion once felt the same way I have. Thank you for this! Thank you for this. Ive always thought that you knew what you wanted to do from the get go.its nice to know that im not alone in this. I hope you write more about your experiences and how you found out what you wanted to focus on. This what just what I needed to hear, Katie. I'm in the exact same position that you used to be in. I don't know what I'm good at, or what I really want to do. I admire and envy people who have a natural artisic talent, because I have to work so hard at it. It can be discouraging at times. It's reassuring to know that you, with as passionate and talented as you are, once felt the same way. I do hope that you'll share more about how you found your niche! :) this was a great post! I didn't start sewing til I got out of highschool too - too worried about the wrong things ;) glad to see I'm not alone! I would LOVE to hear your love story with Johnny! Have you guys dated since highschool?! So sweet! Well said in every way. something i thought you would love as an accordion player! Love your blog! always upbeat and happy! I so needed this right now... There are quite a few changes going on in my work schedule right now and I've been at a loss as to how to fill the time. In the back of my mind a little voice has been saying, "Learn to sew! Explore opening an Etsy shop for your photography!" But it's all so scary. I need to keep this blog post somewhere where I can see it. THIS is wonderful. I couldn't agree with what you said more. You and your words are inspiring. Tweeted this post. Super inspiring. I graduated college a few years ago with a degree in a very specific technical field. It didn't take too long in the "real world" to decide that I do not want to pursue furthering my career in that field. It was not a good fit. After having that revelation, I felt so lost. My degree does not translate well to other career paths, and my options seemed slim to none. Did I seriously waste four years earning a useless degree? How do I explain my "change of mind" in future job interviews? Where do I go from here? Flash forward to the present. I have been blessed with a string of steady 9-5 jobs. They do not give me much creative fulfilment, but they pay my bills and afford me a modest lifestyle. For that I am thankful. I am still searching for my niche in the creative world, which is where I want to be. Perhaps the thing holding me back is my fear of trying and failing...again. Thank you, Katie, for sharing this inspiration. It was a reminder for me to reflect upon the events of the past few years, not with regret, but with hope! I am feeling very inspired. very true. we always admire or see the finished product or end result, but what we don't know is all the time & effort put behind it. strong words, & sentiment dear katie. I just HAVE to say this. I hope I don't come across as too overzealous. When my friend showed me your etsy page two Christmas's ago (and bought me Frank the rabbit!) I fell madly in love with your talent. I came across your blog and I started to look up to you after a while! I just wanted to be when I grew up. Yet, I was so disheartened I kept complaining to my husband the exact same thing! I compared myself to you and other talented internet people loads as well. I thought there was nothing I had that was particularly special and nothing I would ever be good at. I thought you just were good at something or were forced into it by your parents when you were two. I was even feeling a bit bummed out about my lack of talent today and you have NO idea how much this post means to me!!! It's like exactly what I needed to hear magically popped up on your blog one day. And even though it's what my husband's been telling me, it's like "how am I supposed to believe that for all I know you were born with a sewing needle and Martha Stewart magazine in your hands!" I guess since you're pretty much a rock star too me it's really incredible to finally see the light as far as talent goes. This post is incredible! Great post! So reassuring and encouraging. My problem is that I tend to lose interest in things as soon as I'm able to tick the "reasonably competent" box; I don't stick around to really master them. But I'm getting better about that...! "I often complained to Johnny that I wasn't good at anything and I didn't have any talents. Though he tried to reassure me countless times, I still felt uncreative and lost. I just assumed that people who were good at things just "got" them and I hadn't really "gotten" anything. " Yeah, you're the kind of lass that makes it look easy, even if it's not. Also, so adorable to boot that I'm not sure I can keep reading you because my husband will worry about which way I am inclined. Oh Katie thanks for this post too. Wow you just got the words out of my head. I have felt like this so many times & still am trying to find my way. My dream has been to go to New York for a semester or two to go to art school for my Masters. My parents are totally against this and it breaks my heart. My boyfriend of five years is extremely excited for me to go. But my parents are a little strict and don't think I'm ready for it. There are some health issues I need to work through in order to get my stuff together, but I am still determined to go! YES! Thank you so much for linking to this in one of your newer blog posts! I also have that feeling of not being *good* at anything or having any particular good talents, and this post is so right on.. Thanks. Yes, yes, yes. I have too many interests and most of the time I intensely focus on one thing for about a week or so and then bounce on to the next thing. So, I'm a jack of almost all trades but I've never really mastered anything. And the things that I seem to do really well at are things that I hate with a passion. I have always enjoyed making jewelry but I've been debating on how to take my craft to a more professional level. I think that I have that figured out (finally!). Thank you for sharing this inspirational post, it is exactly what I needed to read!